Lane's leather protector kit will soften, clean and restore all leather surfaces removing dirt, oil and grime, safely and effectively. 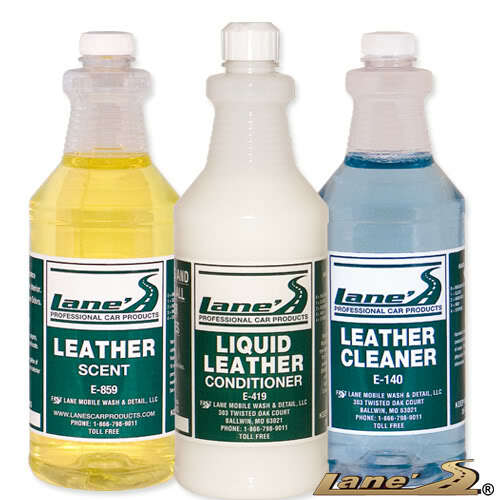 Lane's combines the best auto leather care products in one easy to use kit. This kit starts with Lane's Leather Cleaner. This cleaner will clean and soften your leather surfaces. This professional cleaner is easy to use and is safe for all leather surfaces. Next, apply Lane's Liquid Leather Conditioner which is a rich, creamy conditioner and preservative that is fortified with natural moisturizers which helps restore and conserve automotive leather interiors. For the finishing touch to this package, Lane's Leather Scent is the answer to restoring the leather smell to your new or used automobile interior.